Do not spread generic types around. They are ugly and primitive. Before we got Generics (2004 in Java, 2005 in C#, and 2009 in Delphi) the way to enforce type safety on a collection type was to encapsulate it and use delegation. // to implement Remove, foreach, etc. Nowadays, we can construct our own type safe collection types with a single line of code. That alone is good reason to love generics, and there lies the problem; many developers have come to love their generics a little too much. The expressiveness of generics comes at a price, the price of syntactic noise. That’s natural. We must specify the parameterized types somehow, and the current syntax for doing so is probably as good as anything else. Still, my feeling when I look at code with generics is that the constructed types don’t harmonize with the rest of the language. They kind of stand out, and are slightly negative for code readability. This might not be so bad, but when we start to pass the constructed types around they become more and more like litter. Besides being noisy, the constructed types expose implementation decisions. In our case the list of orders is implemented as a straight list. What if we found out that using a hash table implementation for performance reasons would be better? Then we’d have to change the declaration in all those places. A related problem is that the constructed generic types encourage design that is more procedural than object-oriented. As an example, consider the CalculateTotalSum method again. Clearly, this method belongs in the List<OrderItem> type. Ideally, we should be able to invoke it using the dot operator. But we cannot make that refactoring. We cannot add a TotalSum method to the List<OrderItem> type. (Well maybe we can if we make it an extension method, but I wouldn’t go there.) In that sense, constructed generic types are primitive types, closed and out of our control. Don’t get me wrong. I use generics a lot. But for the previously given reasons I do my best to hide them. I do that using the same encapsulation technique as before, or – at the very least – by inheriting the constructed types. That is my view on Generics. What is yours? Just to be clear, the beef I have with Generics is with constructed types alone. I have nothing against using open generic types in public interfaces, although that is more likely to be a tool of library and framework developers. 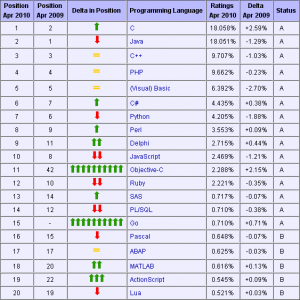 According to Tiobe Programming Community Index as of April 2010, Java is no longer the most popular programming language. C is; Not due to a sudden increase in popularity of C, but rather a cause of Java’s ongoing decline. 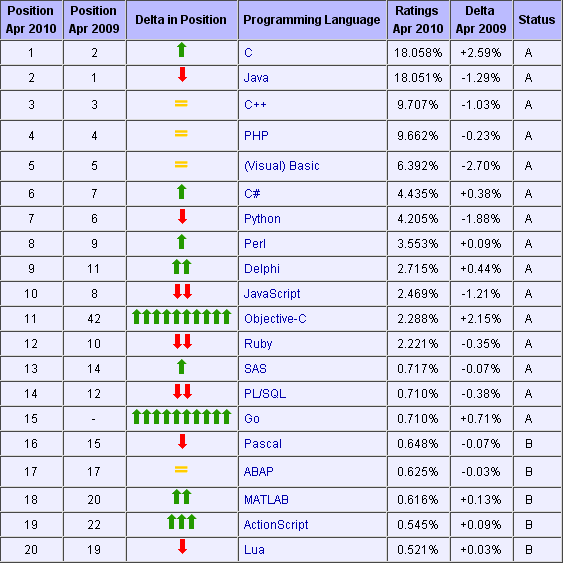 After more than 4 years C is back at position number 1 in the TIOBE index. The scores for C have been pretty constant through the years, varying between the 15% and 20% market share for almost 10 years. So the main reason for C’s number 1 position is not C’s uprise, but the decline of its competitor Java. Java has a long-term downward trend. It is losing ground to other languages running on the JVM. An example of such a language is JavaFX script that is now approaching the top 20. It’s important to point out, thought, that only the language part of Java is losing ground. As Tiobe Software indicates in their comment, the JVM is as hot as ever with all kinds of cool language evolution occurring. Another interesting note to make about the april index is that Delphi is once again among the top ten. I’m really happy about that, although it means my old prophecy of a hasty decline kind of puts me in the corner (although I’ve already taken it back). A third point is the giant leap of Objective-C, from 42:nd to 11:th most popular language. This is a combination of iPhone’s popularity and the fact that Objective-C is the only OO alternative allowed on that platform, besides C++. When it comes to the question of whether methods should be virtual by default or not, there are two schools of thought. Anders Hejlsberg, lead architect of C#, describes them in an interview from 2003. As I told you about in my post from last week, I have left the “pragmatic school of thought” to join the “academic” camp. The main reason was unit-testing, that – in my opinion – calls for a more flexible object model than the one of C#. When unit-testing, I often want to use components in unusual ways, all in the name of dependency breaking, and therefore I like their methods to be virtual. Every time you say virtual in an API, you are creating a call back hook. As an OS or API framework designer, you’ve got to be real careful about that. You don’t want users overriding and hooking at any arbitrary point in an API, because you cannot necessarily make those promises. Whenever they ship a new version of the Java class libraries, breakage occurs. Whenever they introduce a new method in a base class, if someone in a derived class had a method of that same name, that method is now an override—except if it has a different return type, it no longer compiles. The problem is that Java, and also C++, does not capture the intent of the programmer with respect to virtual. C# captures the intent better and avoids versioning problems, and Java offers the flexibility needed for unit-testing. Which is better? The answer seems to be: it depends. But, do we really have to choose? Why can’t we have both? Well, I think we can, and Java has shown the way to achieve it. Java annotations is a powerful language feature. (The concept was rightfully stolen from C# where it is called custom attributes.) With it one can attach metadata to parts of a program, to give additional information to the compiler or other external agents. In other words, annotations can be used to extend the programming language without the need for changing the language itself. A good example is the @override annotation. [@override indicates] that a method declaration is intended to override a method declaration in a superclass. If a method is annotated with this annotation type but does not override a superclass method, compilers are required to generate an error message. The use of the @override annotation takes care of the problem when name changes to virtual methods silently breaks behavior of descending classes; Or, which is more common, when misspelled names of intended overrides aren’t captured at compile-time. Now, with the introduction of the @override annotation, you can help the compiler help you to fail fast. It is now possible to show your intention better than what was possible in the pre annotation days. Unfortunately Java doesn’t take this concept all the way. They could have introduced an @virtual annotation as a complement to @override, and thus reach the same level of expressiveness as C#, but without forgoing the flexibility of the Java object model. It would be the perfect middle-way, and provide the best of both worlds. The benefit of an annotation (or custom attribute) based solution is that it’s configurable. It would be possible to alter the compiler’s behavior based on context or environment. For instance one could enforce the use of @virtual and @override in production code. Additionally, one could relax the controls when necessary, like in test projects or legacy code, to mere warnings or complete silence. Wouldn’t that be better than the all or nothing solutions of today? Note: This article was written before D got full closure support. Delegates are something that gives me mixed feelings. While I used to embrace them in Delphi and Object Pascal, I now find them difficult to get used to in C#. I guess that is because they introduce a little of the functional programming paradigm into an otherwise object oriented environment. Don’t get me wrong, I do find delegates powerful and I use them whenever I see fit. It’s just that they bug me, like a badly-pitched note in an otherwise perfect chord. In that respect I am much more fond of the inner classes of Java. The D Programming Language, my favorite pet at the moment, has support for both delegates and inner classes, thus providing the best of both worlds. And since D is a multi paradigm language with support for functional programming, its delegates are justified. The semantics of D delegates are somewhat different from that of C#. For instance, C# delegates may bind to both static and non-static methods, while D may bind to non-static methods only. But on the other hand, D delegates may also bind to inner functions, which makes them look a lot like closures. In order to be a real closure a delegate is required to keep variables that are bound from the surrounding environment alive, even if the program has left their scope. For example, consider the following program. The countdown function returns a delegate that refers to the inner function countdown_helper. Counter_helper binds the variable current from it’s parent by returning its value and decreasing it by one. So, if D’s delegates were real closures the first invocation of the delegate in the above example should return 10, the second 9, followed by 8, 7, and so on. But in reality they produce bogus values like 4202601 or 4202588. The reason is this: D doesn’t implement real closures. The variable current is invalid because the program is no longer executing the countdown function when countdown_helper is invoked via the delegate. So D doesn’t have real closures, is that a big deal? No! In my opinion real closures are not important for languages that are not pure functional. The creators of D shouldn’t waste their resources on this feature since it brings little value but lots of implementation complexity. The energy is better spent on features like multicast delegates. Those would bring value in the form of convenience, and I hope future versions of D will incorporate them. Complete versions of the code samples in this post can be found here and here. C# entered the field of battle some seven years ago as a better version of Java. The one feature that many people referred to when claiming C# superior, was custom attributes. Now Java has them too, but they go under the name of annotations. The ability to attach meta data to various parts of your program is a powerful way to integrate with frameworks or configure external utilities. Mike Kaufman, for example, used annotations beautifully to configure an Obfuscator. He has posted the details on his blog. Is agile only for elites? Is IEE 754 too advanced?